A hazardous area is defined as an area in which an explosive atmosphere is present, or may be expected to be present, in quantities such as to require special precautions for the construction, installation and use potential ignition sources. The purpose of area classification is to provide a basis for the correct selection, installation and location of electrical and non-electrical equipment in those areas. Areas must be classified depending on the properties of the flammable vapours, liquids, gases, mists, combustible dusts or fibres that may be present and the likelihood that a flammable or combustible concentration or quantity is present. The aim of area classification is to avoid ignition of flammable release that may be occur in the operation of facilities. The intent is to reduce to an acceptable minimum level that probability of a flammable atmosphere and an ignition source occurring at the same time. The probability of the presence of gas. The quantity and duration of hazardous vapour. The nature of gas : either lighter or heavier than air. Zone 0 - An area in which an explosive atmosphere is constantly present, or present for long periods. 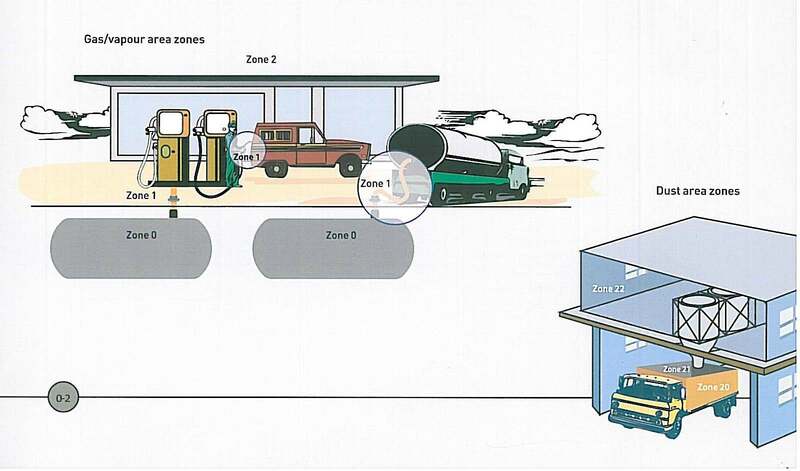 Zone 20 - An area in which combustible dust, as a cloud, is present continuously or frequently during normal operation in sufficient quantity to be capable of producing an explosive concentration of combustible dust in a mixture with air. Zone 21 - An area in which combustible dust, as a cloud, is occasionally present during normal operation in sufficient quantity to be capable of producing an explosive concentration of combustible dust in a mixture with air. Zone 22 - An area in which combustible dust, as a cloud, may occur infrequently and persist for only a short period, or in which accumulations of layers of combustible dust may give rise to an explosive concentration of combustible dust in a mixture with air. The grouping of gases and vapours are classified into Group I and Group II categories. Group I is for Mining Applications and Group II is for General Industry. Group I equipment has a representative gas of Methane and all equipment used in underground mining applications fall into this categories. Any other equipment will be Group II classified. Equipment and apparatus certified with Group IIC can be used either in IIA, IIB and IIC areas. But items certified with IIA only can be used in IIA areas and so on. Temperature classes T1 to T6 are used for all protection techniques, and correspond to the electrical devices maximum operational temperature.The better the equipment, the lower the rated surface temperature. Therefore, those items certified as being T6, can be used in T1, T2, T3, T4, T5 and T6 gases. Whereas a T2 certification only allows a piece of equipment to be used in T1 and T2 gases. IEC/EN 60079-10 - Electrical apparatus for explosive gas atmospheres. Classification of hazardous areas. IEC/EN 60079-14 - Explosive atmospheres. Electrical installations design, selection and erection. IEC/EN 61892-7 - Mobile and fixed offshore units. Electrical installations. Hazardous areas.